Last week, the Bank of Namibia elected to leave its repo rate unchanged at 6.75%. Banks such as Trustco Bank need to keep abreast of such announcements, as any change will affect the rates offered to lenders and savers. With no change, this means borrowers, and savers, can expect that the current status quo reigns supreme. Unfortunately, it also means that there is no easing for lenders, even as savers remain smiling. Why does this decision fall upon the Bank of Namibia? The easy way to answer this, is simply to state that the Bank of Namibia is a central bank, and it derives its authority from our constitution – Chapter 17, Article 128. But as with most institutions in the modern age, central banks originated from the last great empire – the British Empire. Back in the 1690’s, the Kingdom of England was involved in a war with France, and King William III’s government found it difficult to procure funds for this war. Credit of a government, up until that point, was tied to the reigning monarch, and different ones had different levels of fiscal responsibility. Monarchs are notorious for not wanting to relinquish authority until they have no other choice, and so too here. Up until that point, the printing of currency was under the sole authority of the king, which is why he was having credit issues. Lenders did not want to lend money to a king who would just print more currency, and thus devalue the money they lent to him. Thus, the Bank of England was born, to which was entrusted not only the accounts of all of government, but also the exclusive right to issue bank notes. When the Bank of Namibia was established this was one of the responsibilities it gained. Initially, all of the money printed by the bank was backed by gold, but the first cracks in this system appeared in 1797, when a bank run to convert paper money into gold occurred. The Bank of England suspended conversion into gold, and in the analysis of the bank run afterwards, it was resolved that the central bank should not only act to stabilize the currency, but also act as a lender of last resort for other banks. And so the final few functions normally attributed to central banks was born. As wars proliferated, so did central banks, as kings and presidents were unable raise the necessary debt to sustain their war efforts. But central banks survived the wars, and in peacetime they grew to serve an important function. After all, stabilizing the currency is of great importance for economic development – and although it was originally meant in terms of foreign exchange, central banks increasingly saw the need to stabilize price levels, or inflation. Inflation, in a sense, is the result of the printing of money. After all, money is a claim to goods and services. If we have the same amount of goods and services available, but more money was printed, a greater ‘share’ of this money would be required to acquire the same goods and services. If money were printed recklessly and in excess of economic production, the value of money would fall rather quickly, and we’d have high inflation. In extreme cases, such as that of Zimbabwe, when the money printing reaches such levels that you get hyperinflation, people lose faith in their currency, and no longer transact in it. This is quite important, because while as previously mentioned money could in the past only be printed provided it was backed by gold, that is no longer the case. Until 1971, this was still broadly true, but after US president Richard Nixon suspended the convertibility of the US dollar into gold, no country was willing to do so any more. Our money, right now, is backed by our faith in the money being able to be exchanged for goods and services. You trust that that N$10 note you have can buy goods and services to that value, and when you hand it over, it will be accepted. But without control, that faith could be shattered, and the Namibian Dollar could go the route of the Zimbabwean one. 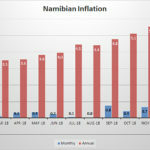 That is why the Bank of Namibia has a mandate to ensure inflation remains in the range of 3% to 6%. Well enough above zero that we are not in danger of sliding into deflation, small enough that it can be reliably modelled for, and not disruptive to the general economy. It is also why the Bank of Namibia is independent from government, so that it can focus on this mandate without interference, and without the executive influencing policy. But where other central banks have a bit more policy options, the Bank of Namibia has only a few – due to the currency peg to the South African Rand. And its main policy instrument is thus the Repo Rate. After all, most money creation these days happens via commercial banks, who extend credit. Suffice it to say that by increasing or decreasing the cost at which bank can lend from the central bank, the Bank of Namibia thus reduces or increases the amount of credit commercial banks can extend, thus reducing or increasing the money in circulation. 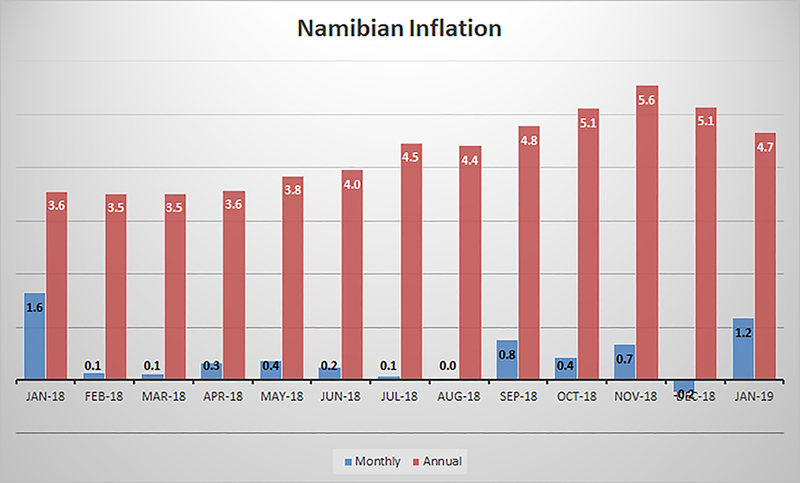 With inflation over the past year steadily increasing, the Bank of Namibia had a hard time balancing it’s control over inflation versus easing the interest strain on the economy. But with inflation seemingly having stopped its relentless upward march, the time will soon come when they might feel a little more lenient. Until then, Trustco Bank will continue to offer it’s great savings rates for its customers, ranging from 4.5% on call accounts to 10% on 60-month fixed-term deposits.